The revelations caused an immediate furor and triggered denials from both Chinese and Kenyan officials. China is currently Kenya’s largest bilateral creditor, and many raised questions about the mounting risks the East African nation faces as it borrows more money to fund large infrastructural projects. The uproar also brought to fore the issue of “debt trap diplomacy”: a term that has gained popularity in the lexicon of global geopolitics as China flexed its influence worldwide. The specter of Beijing extracting economic or political concessions from a nation unable to pay its debt obligations was first underscored in Dec. 2017, when Sri Lanka gave 70% equity and a 99-year lease for its strategic Hambantota port. 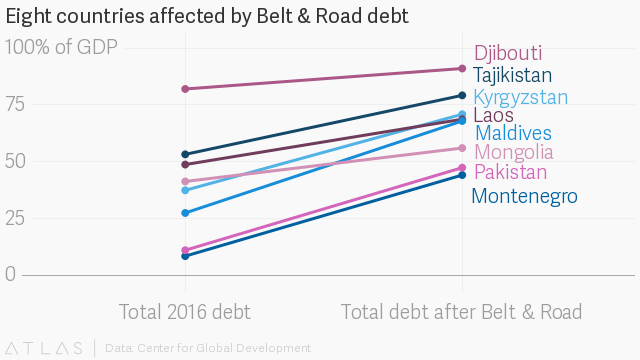 Since then, nations from Djibouti and Maldives to Laos and Pakistan have been named as facing risks of debt distress, especially in the face of the multi-billion dollar Belt and Road initiative. Last year, Beijing was also accused of taking over Zambia’s national electricity supplier and rebuilding the Mogadishu seaport in exchange for “exclusive” fishing rights along the Somali coast—allegations that proved inaccurate and officials have refuted. REUTERS/Joseph Okanga Docking at the Mombasa port. The opacity surrounding Chinese deals in Africa—besides those signed with the US and Europe— also showcases, Were says, Africa’s weak economic diplomacy and the deficiency in creating institutional frameworks catering to taxpayer interests. This is especially crucial in a multipolar world where the scope of interest and engagement in Africa is widening beyond China, the EU, and the US to include Brazil, Turkey, India, Japan, and the Gulf states. This is especially true of smaller nations with weak governments like Somalia, which not only faces technical and resource constraints but also the mechanisms to “ensure compliance, financial probity, and oversight,” says Rashid Abdi, the Horn of Africa project director at the International Crisis Group. REUTERS/Thomas Mukoya New railway line. Growing effective at these negotiations will be crucial as China faces an economic slowdown, ballooning debt, internal criticism on why it was spending taxpayers’ money abroad, besides external reproach that its Africa presence was akin to neo-colonialism. The state-funded insurance firm Sinosure, for instance, recently said it lost up to $1 billion on the Addis-Djibouti railway. Moore says that means the “validity and legitimacy” of Chinese loans will continue to be questioned if done in secret, especially if a nation is committing to an obligation for two to three decades.